Between J16 and J17, there are traces of a missing junction - the end of the motorway link which would have served north Glasgow. 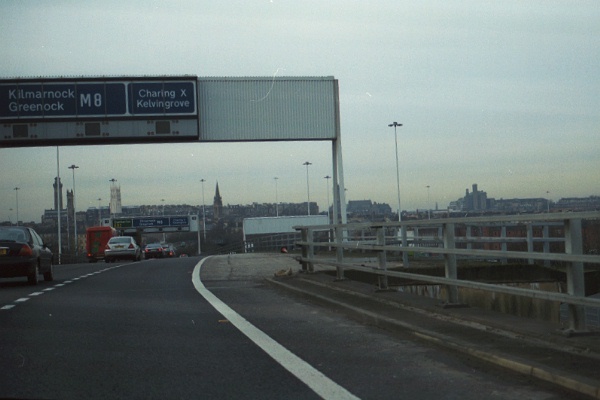 Construction of the motorways in the 1960s coincided with the closing of Glasgow's canals to navigation. 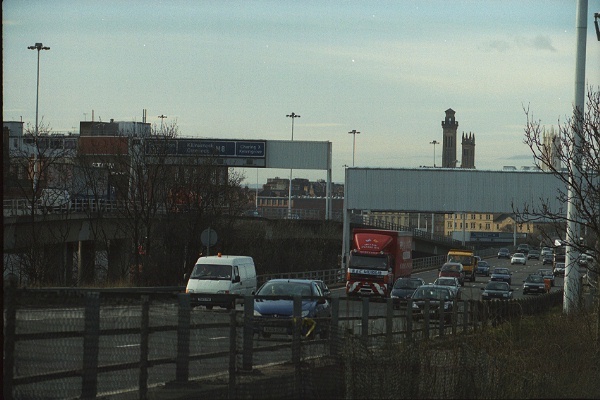 The motorway east out of Glasgow followed the line of the then newly-closed Monklands Canal, now the M8 from J15 to J9, and the motorway to the north would have followed the branch of the Forth and Clyde Canal from Port Dundas. The north Glasgow motorway was planned to follow the line of the canal for just a couple of miles before branching. The western branch would thread through Bearsden and Drumchapel towards the A82. The eastern branch would have served Bishopbriggs and Kirkintilloch - possibly linking up with the M80 near Cumbernauld. With the Forth and Clyde Canal now reopened as a major Millennium project, The Millennium Link, completion of this motorway looks extremely unlikely. The viaduct for the westbound carriageway has a sudden widening at this point, the ghost ramp for a right-hand entry. Seen from the motorway, the lanes slew sharply to the right where the bridge widens. I would guess that the original motorway here would have had at most three lanes plus a hard shoulder, and one or two lanes joining from the right. Looking west from alongside the motorway, the ghost ramp is just this side of blank panel on the far gantry. 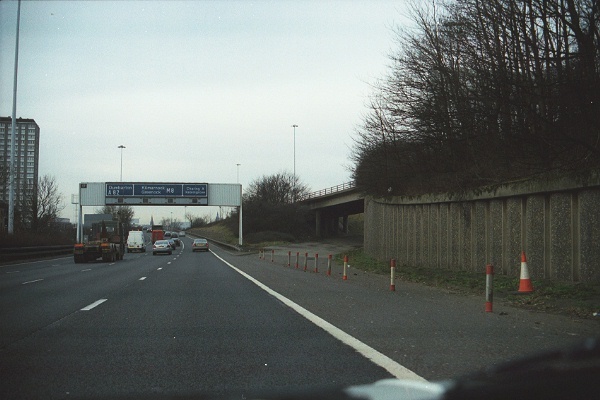 The two carriageways are at slightly different levels, so the missing ramp would have crossed over the eastbound carriageway where it dips and descended to join the westbound carriageway at its highest point. There's a stub exit from the eastbound carriageway at its lowest point, just beyond the lamp standard in the foreground and this side of the gantry - the curved rail can just be made out at the right side of the photo. Shortly before the westbound viaduct begins, there's a pronounced dip with the matching right-hand exit, passing underneath the eastbound carriageway and leading off the north. The cutting ends just beyond the bridge, but would have led directly along the line of the canal. 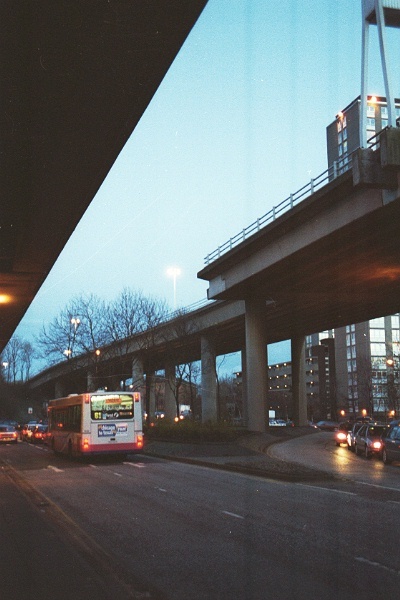 The eastbound carriageway, up above, has an unused entry, also at its highest point.